Our Quickstart Pack is designed to help you quickly and safely dispense with poor eating habits and move on to a healthier lifestyle. To help maximise your effort, replace two of your meals each day with our nutritious, easy-to-make shakes. 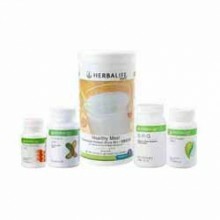 2 shakes daily as a meal replacement for weight loss and 1 shake for weight maintenance. NRG Nature's Raw Guarana for an energy boost. Lipo-Bond to block fat and ensure intestinal health. Snack Defense to help stop hunger.